Practitioners of Buddhist meditation have reported seeing globes, jewels and little stars during meditation-induced light experiences. The neurobiological explanation for these visions was the subject of a recent study led by Willoughby Britton, assistant professor of psychiatry and human behavior, and Jared Lindahl, professor of religious studies at Warren Wilson College in North Carolina. The study, published in the journal Frontiers in Psychology Jan. 3, connects first-hand accounts of these light experiences and reports of them from Buddhist texts to scientific literature on similar light visions that occur during sensory deprivation, perceptual isolation and visual impairment. Sensory deprivation, or the lack of input to one’s senses, and perceptual isolation, a monotonous form of input, bear similarities to certain meditation practices and can therefore be used to investigate the biology behind these light experiences, Britton said. Buddhist meditation, said Noah Elbot ’14, a leader of the Brown Meditation Community, includes practices such as breath awareness, repetition of a particular phrase, or concentration on an image in order to bring the mind to the present. Because the blocking of sensory input is seen in both sensory deprivation and Buddhist meditation, the authors hypothesized that the light experiences may be caused by a spontaneous firing of neurons in response to a lack of input, a phenomenon referred to as homeostatic neuroplasticity, Britton said. These visual hallucinations induced by meditation practice suggest that meditation may lead to increased neuroplasticity, which has been linked to cognitive improvements in learning, memory and attention, according to the study. If this hypothesis proves true, meditation could have significant cognitive benefits. This study is one of the first that attempts to connect data from historical texts and first-hand reports from current meditation practitioners with scientific research. “While science has been studying meditation as a way of better understanding the brain, it often overlooks the rich information that religious texts have,” Lindahl said. If people examine meditation only from a scientific perspective, their understanding will be limited, he added. “This is a paper that respects what the humanities have to offer to science,” Britton said. While meditation is being used increasingly as a clinical practice, the tremendous amount of knowledge on meditation is not being communicated to the scientists and clinicians using it, she added. Mind over matter is a difficult state to achieve, but according to a new study, meditation might provide some help in getting there. Research from Johns Hopkins University, Baltimore, suggests that 30 minutes of daily meditation may help alleviate the symptoms of anxiety, pain and depression. This six-month study, led by Johns Hopkins assistant professor Dr. Madhav Goyal, found that those suffering symptoms of anxiety and depression saw “a small but consistent benefit” after an eight-week week training program in mindfulness meditation. The research found that this type of meditation, which focuses precise attention to the present moment, had a tangible effect on symptoms of anxiety and depression, especially those associated with a clinical medical condition. Dr. Goyal explained that while the study focused on the effect of meditation, it also examined the effectiveness of the meditation on symptoms of anxiety and depression. “We compared it to what other studies have found in similar populations using antidepressants, and the effect is about the same,” he says. The beneficial results of meditation were consistent even when the study allowed for the placebo effect, wherein patients feel better because they perceive they are getting help. However more studies will be needed to determine just how powerful the effects of meditation are for those suffering from anxiety and depression. Goyal says that one of the benefits of using meditation for medical therapy is that there are no side effects. For people who are already on a medical regimen, this opens up the possibility of treatment – as long as they have the time to learn and the willingness to practice. But patients from the study’s 47 clinical trials showed consistent improvement over the course of six months. From those results, meditation presents an intriguing option for those dealing with anxiety symptoms. And it’s open to almost everyone. Washington: A new study has revealed that technique incorporating meditation and yoga can benefit patients with high blood pressure or `prehypertension`. The study by Joel W. Hughes , PhD, of Kent State (Ohio) University included 56 women and men diagnosed with prehypertension. One group of patients was assigned to a program of mindfulness-based stress reduction (MBSR): eight group sessions of 2 and a half hours per week. Led by an experienced instructor, the sessions included three main types of mindfulness skills: body scan exercises, sitting meditation, and yoga exercises. The other “comparison” group received lifestyle advice plus a muscle-relaxation activity. This “active control” treatment group was not expected to have lasting effects on blood pressure. Researchers found that patients in the mindfulness-based intervention group had significant reductions in clinic-based blood pressure measurements. Systolic blood pressure (the first, higher number) decreased by an average of nearly 5 millimeters of mercury (mm Hg), compared to less than 1 mm Hg with in the control group who did not receive the mindfulness intervention. 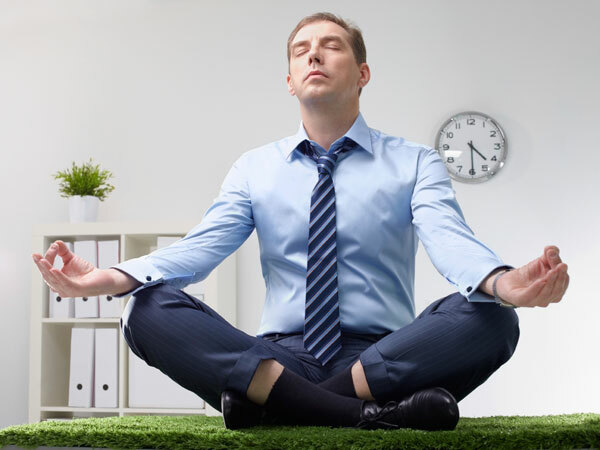 “Mindfulness-based stress reduction is an increasingly popular practice that has been purported to alleviate stress, treat depression and anxiety, and treat certain health conditions,” Dr Hughes said. The study is published in Psychosomatic Medicine: Journal of Biobehavioral Medicine.